This is a sponsored post curated by me on behalf of Maryland 529. All opinions are 100% mine – and I am too an owner and contributor to a Maryland 529 Investment Account! There is probably not a week that goes by where someone expresses to me that this is one of their financial goals. However, for some reason, it is often the goal that is most postponed because many families feel as though they can’t afford it! Growing up, I was very fortunate that my grandfather took the time to start saving for my future. When he started, it wasn’t with a huge pot of cash; he started with something as simple as $25 a paycheck and as his income increased, he would increase those saving amounts. This may not sound like much, but he started small and he started early. When I got my first job out of college, I wanted to do something for my baby sister, so I did the same thing as my grandfather! I opened a Maryland 529 plan in her name with $25! That was almost 10 years ago and Maryland 529’s college savings plans now are even better! If you have been dragging your feet on getting started, or always felt like you couldn’t afford it, you have to check out Maryland 529s Save4College State Contribution Program! This image from Maryland529.com clearly shows the power of starting early! 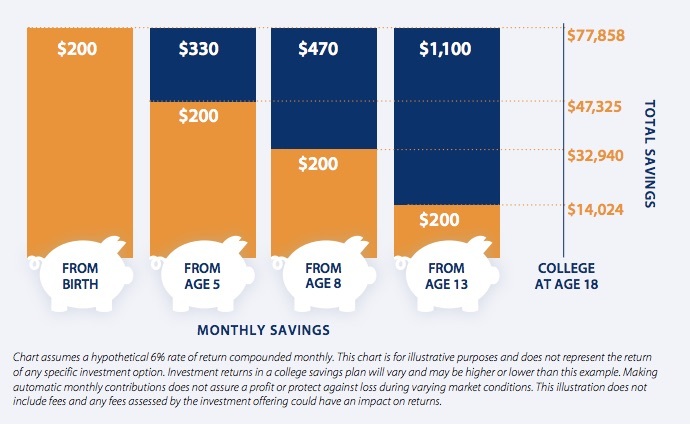 This person started saving $200/month at birth and will have approximately $77,858 saved by age 18, versus the person who waits just five years and will have to save $330/month or start at age 13 to save $1,100/month! Start Now! What is Maryland 529 Save4College State Contribution Program? The beneficiary of the account must be a Maryland resident. If you’re an individual your household income cannot exceed $112,500 or $175,000 for couples. How do you get your free money? Based on your income (see chart below), you must make a minimum contribution of $25, $100 or $250, between July 1 and November 1, 2017. They are waiving the initial contribution requirement, so you can open the account now and don’t have to make a contribution until later! Once the account is open and you make your contribution and you are determined to be eligible, the State of Maryland will deposit $250 into your new Maryland College Investment Plan account by, December 31, 2017! You can continue to make contributions as small as $25/month into your new plan. Another great way to help save for your child’s college is to dump any birthday money into your new college plan or request family members to contribute to your child’s future via the college plan instead of toys. If saving for your child’s college is a goal, I challenge you to start now instead of later! You will thank yourself later for starting today and I know your little one will too! Apply now and learn more about the new Save4College State Contribution Program! *You must have had no existing accounts for the same holder/beneficiary before January 1, 2017. $5,000,000 in fiscal year 2018, (ii) $7,000,000 in fiscal year 2019, and (iii) $10,000,000 in fiscal year 2020 and each fiscal year thereafter. As with the entire State budget, the Maryland General Assembly has final approval. If resources are insufficient to fully fund all eligible accounts, Maryland 529 shall provide contributions in the order in which applications are received and give priority to applications of Account Holders who did not receive a State Contribution in any prior year. Please note, an Account Holder is not eligible for the State income deduction on their taxes for any taxable year in which the Account Holder receives a State contribution. You should check with your tax advisor regarding your specific situation. Please read the Enrollment Kit at https://maryland529.com which describes the investment objectives, risks, expenses, and other important information that you should consider carefully before you invest. If you or your beneficiary live outside of Maryland, you should consider before investing whether your state or your beneficiary’s state offer state tax or other benefits for investing in its 529 plan.